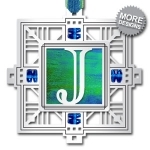 Shop Kyle's personalized Christmas ornaments crafted in 500+ silver and gold filigree designs to create unique 2015 holiday gifts for every interest. 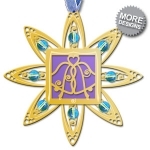 Each custom ornament is accented with gorgeous colors and glass beads and comes on a hanging ribbon. Gift boxed and proudly handmade in USA. Ships fast! 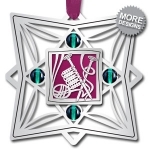 Shop unique engraved Christmas ornaments personalized just for you - customize your bead colors, metal finish & design choices. 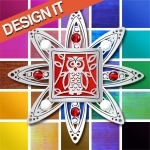 You'll love these engraved Christmas ornaments crafted with 100s of theme designs and 40 colors. 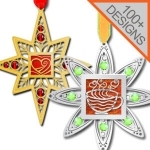 Each of these unique metal ornament gifts is made in USA with one of Kyle's artistic designs surrounded by a gorgeous beaded metal ornament frame in silver or gold. 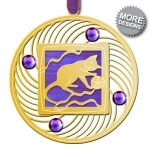 Create the perfect holiday gift for everyone on your list with unique engravable ornaments featuring thematic designs of animals, sports, monograms, nature themes, religions, and other popular symbols. Truly original, uniquely yours. 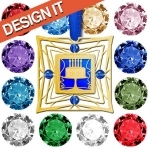 Want to design your own ornament? 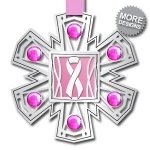 Click Customize My Ornament to choose an ornament body style, add a design that reflects your interests, and finish off with your favorite accent colors. 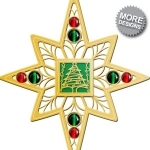 Find a beautiful collection of unique Christmas tree ornaments, photo frames and special occasion décor personalized with 100's of vintage or contemporary designs, glass beads and silver or gold metal colors. Create and personalize your own elegant Christmas decorations to make your holiday an event to remember. 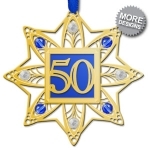 Seasonal ornaments to mark important milestones, birthdays and important events such as the birth of a baby, graduation from college or a new job. Who said ornaments are just for Christmas? 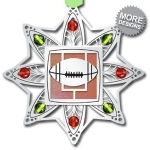 Make any celebration an event to remember when you design your own handmade ornament gift from Kyle Design. 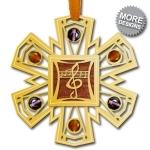 Exclusively crafted with your selections of silver or gold metals, gorgeous beaded color combinations and unique design image, each keepsake ornament is made to order for a personalized gift-giving idea that's unlike any other. Give your loved ones something to smile about when you create your own beautiful ornament for a gift that keeps on giving. Meaningful yet affordable, Christmas ornaments are an excellent gift solution for X-mas celebrations, festive parties or even just to send your best wishes during the holiday season. Forego your annual Christmas card and opt instead for a unique photo frame ornament to adorn the Christmas trees of your long distance friends and family. For an extra personal touch, have your special Xmas ornaments engraved with "Happy Holidays" or "Season's Greetings" to let your loved ones know you're thinking of them this Christmas. If you're looking for a last-minute but sentimental stocking stuffer idea, shop cool monogram letter Christmas ornaments for a quick and easy gift that's personalized especially for your recipient. Animal Holiday Ornaments with cats, dogs, horses, sea turtles and bears make clever gifts for kids, people who love animals or someone who just became a new pet owner. Nature Ornament Gifts featuring beautiful images of flowers, plants and botanicals will definitely make mom, grandma or your mother-in-law smile. 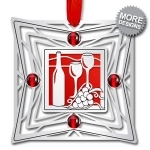 Food & Drink Ornaments are sure to keep dad, grandpa or your husband hungry for an impending holiday feast. 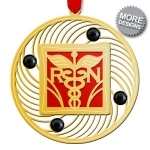 Unique Ornaments for Professionals make fantastic seasonal gift-giving options for your doctor, dentist, postal carrier or co-workers. 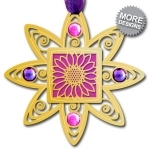 Unusual Symbol Ornaments in American flag, horoscope and Asian character designs are distinctive for anyone who enjoys creative self-expression. Sports Xmas Ornaments will hopefully inspire your brother or boyfriend to find you an equally awesome Christmas present. 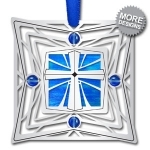 Cool Religious Ornaments decorated with meaningful interfaith images like the Holy Cross and angels are perfect for anyone celebrating the spiritual meaning of the holidays. Beyond the winter holidays, a decorative ornament can make a memorable keepsake to commemorate a major milestone or a landmark event. 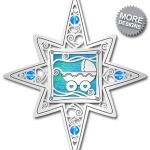 See our selection of cute ornaments for baby's 1st Christmas that new parents can keep for baby as she or he grows up, or our collection of anniversary love ornaments that make beautiful guest favors for weddings or tasteful and elegant gift ideas for wedding anniversaries. 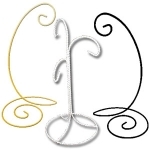 If you know someone that has a birthday coming up, engrave a special numbers ornament for a 13th b-day party, 21st birthday bash or 40th "over the hill" celebration that will go a long way in showing someone how thoughtful you are.